Just weeks after Hurricane Harvey hit Texas, two more "unprecedented" hurricanes made their way to the southeastern United States. Although changes in Hurricane Irma's path spared Florida from the bulk of the damage, both Irma and Maria directly hit Puerto Rico and the U.S. Virgin Islands. Hurricane Maria was particularly devastating for the more than 3.5 million American citizens living in these U.S. Caribbean territories. The CEO of Puerto Rico's sole electric company indicated that the grid had been "basically destroyed." Without electricity, communications were severely limited. (U.S. Army National Guard photo by Sgt. Alexis Velez, public domain). Reliable data is crucial to any relief effort. Rescuers need to know which roads are impassable. Citizens need to know where they can find help. Government agencies such as FEMA need information about the populations with whom they're working. How many people with disabilities were in the affected areas? Where do people who worked in the impacted area live? What proportion of the affected population does not speak English? All this information was already available through different government sources, but its fragmentation limited its usability. OnTheMap uses the different agencies' APIs to make getting meaningful information a simple, one-step process. In the days after the hurricane, information about the state of roads, bridges, and flooded areas in Puerto Rico was scarce. Former FEMA director Michael Brown called the situation a "logistical nightmare." Crowd Rescue HQ, a crowdsourced initiative led by more than 700 volunteers, aimed to help by collecting information from people on the ground. Through an online form, people submitted information about the state of roads, bridges, and flooded areas. Crowd Rescue volunteers then translated this information to data that can be viewed on an online map. Crowd Rescue HQ works with government agencies, such as FEMA, to ensure their data is providing practical value for rescue efforts. NAPSG has been working with the Department of Homeland Security to develop standards for incident maps and GIS applications. This initiative provides a framework for nonprofits, citizens, and government agencies to work together more effectively. By ensuring that incident information is transcribed in a consistent way, government agencies can better leverage external geospatial data in their relief efforts. For example, after Hurricane Irma, NAPSG led an initiative to crowdsource photos of the damage. This geographically encoded data was used by FEMA in its operations and is now hosted on a Department of Homeland Security open data portal. With most of the island cut off from the grid, open data can do only so much. 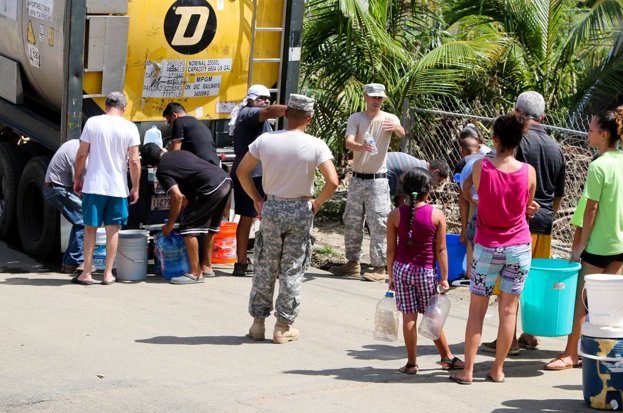 Environmental contamination is widely suspected in the aftermath of Hurricane Maria, yet the Puerto Rico Environmental Quality Board has still not made its measurements public. FEMA is far from transparent. Nevertheless, these three initiatives show how the ideas of open government can directly translate to more transparent, collaborative, and efficient relief operations.